In May-June 1940, the British Army’s Armored Reconnaissance Corps took heavy losses in France and left its matériel behind, on the streets and countryside around Dunkirk. The General Staff was in need of new vehicles fast, capable of gathering intelligence for the cavalry and infantry units. 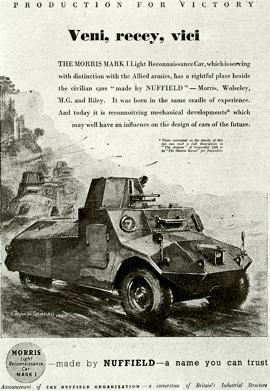 All actors of the British automobile industry answered the call, and a light armored car was quickly designed by Morris-Commercial Cars Ltd. It was chosen in a hurry, despite its unusual configuration, and mass-produced from 1940 to 1944. It was less famous that its Daimler counterpart, partly due to reliability issues and limited off-road capabilities. 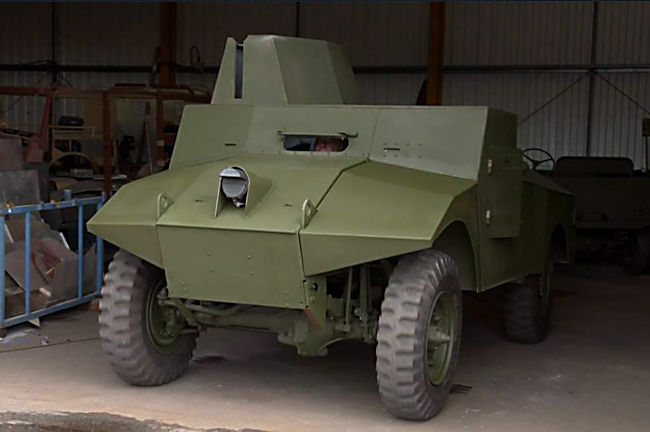 The Morris LRC’s official British Army name was either ‘Car 4 x 2, Light Reconnaissance, Morris, Mark I’ or ‘Car 4 x 4, Light Reconnaissance, Morris, Mark II’ It was based on the chassis and parts of the Morris light truck. A partly-riveted hull made of rolled steel with sloped faces was mounted on this basis. The main oddity of the model was its row of three front seats, with the driver in the middle and gunners at each end. 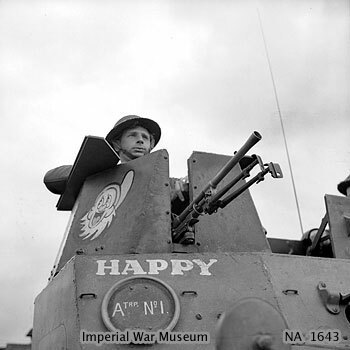 The armament comprised one 13.97 mm (0.55 in) Boys anti-tank gun mounted in brackets in the hatches on the hull roof, and a Bren gun in a small single turret on the right side. A 101.6 mm (4 in) smoke grenade launcher was also added. The AT gunner had access to a radio set at his rear. Armor thickness ranged from 8 to 14 mm (0.31 – 0.52 in). 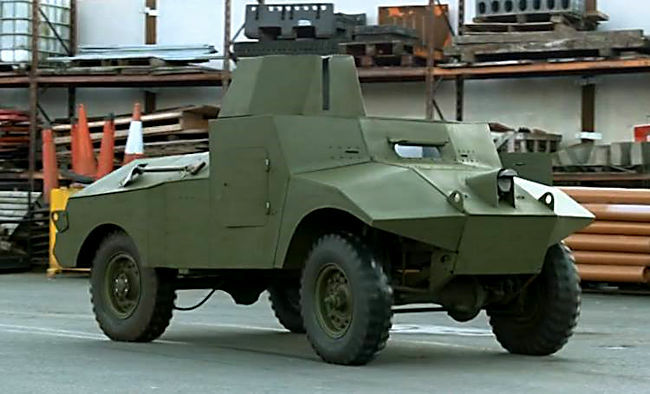 The chassis had a 4×2 rear drive configuration with 9.00 x 60 cm tires. The front suspension was assured by coil springs, and the rear axle had semi-elliptical leaf springs. The transmission included a dry friction clutch, a four-speed gearbox and mechanical brakes. The engine was the Morris EK, 4-cylinder petrol inline, liquid-cooled. It was capable of 71 hp at 3100 rpm, with a cubic capacity of 3520 cc. A reconnaissance unit of the RAF Regiment patrols round the perimeter track at Bradwell Bay, Essex. 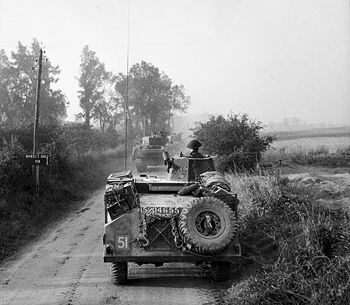 A Morris Light Reconnaissance Car bearing the officer in charge, followed by four airmen in a Jeep as they pass a concealed and protected Douglas Havoc. 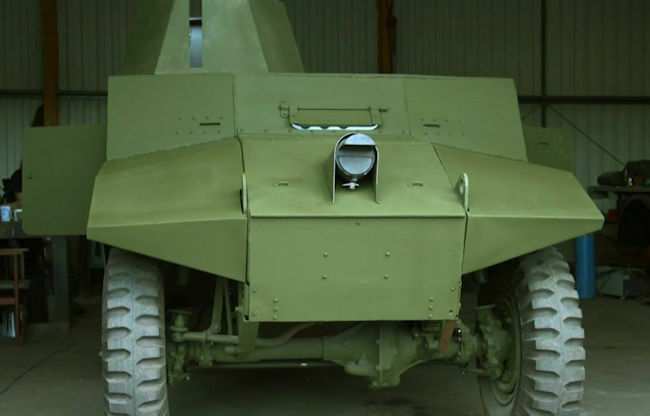 After some tests, the new vehicle was adopted under the designation “Morris Light Reconnaissance Armored Car”, or simply “Morris LRC”. The first production version (Mk.I) barely differed from the prototype, but the second (Mk.II) was equipped with a four-wheel drive chassis, which significantly increased off-road capabilities. A small number of Mk.I OPs (Observation Post) was built for advanced artillery observers. In that case, the armament and turret were dismantled, and two artillery rangefinders fitted instead. 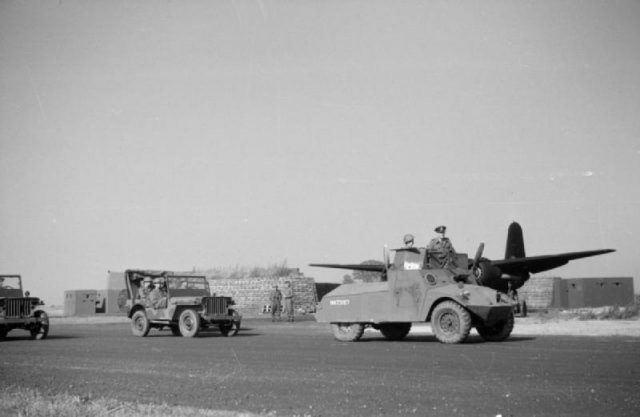 Prototypes included an experiment with two turrets, the Firefly, which mounted a QF 6-pdr (57 mm/2.24 in) gun, the Salamander with two seats and a central top turret, and the Glanville Fighter Car, with one seat and two fixed MGs. The production spanned from 1940 to 1944, with a total ranging from 2055 to 2200 (according to various sources) being delivered. The first machines of this type were sent to Egypt at the end of 1941, where they were partly handed over to the RAF. 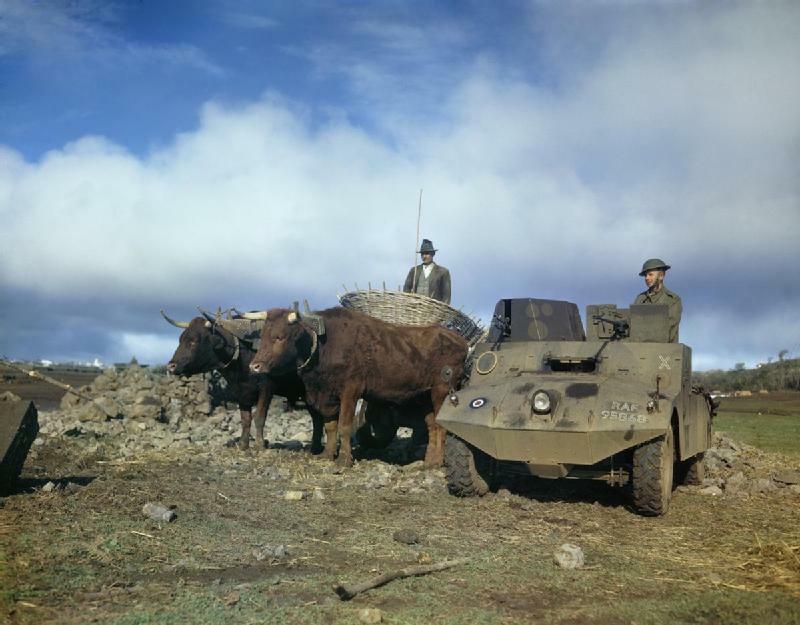 Under the designation Armoured Car Morris Type E, they were used to guard airfields, patrolling nearby areas and advanced reconnaissance. Some Morris were kept in service in the homeland, affected to outposts and patrols. 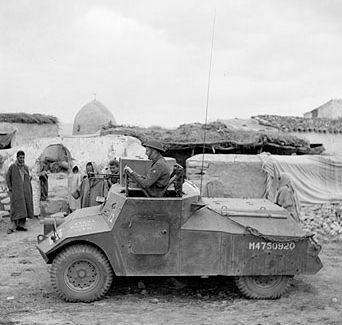 These vehicles participated in the whole North African campaign, until Tunisia, Sicily, and Italy. Besides the British Army in 1942-1943 service, some were transferred to the 12th Podolsk Regiment and 15th Lancers Regiment of Poznań, from the 2nd Polish Corps. These units were actively involved in the Middle East operations. At the Normandy landings, some were part of the 11th and 12th Field Engineer Battalions of the Polish 1st Armoured Division, as well as part of the RAF. By 1945, most were scrapped because of their rushed production and obsolescence. 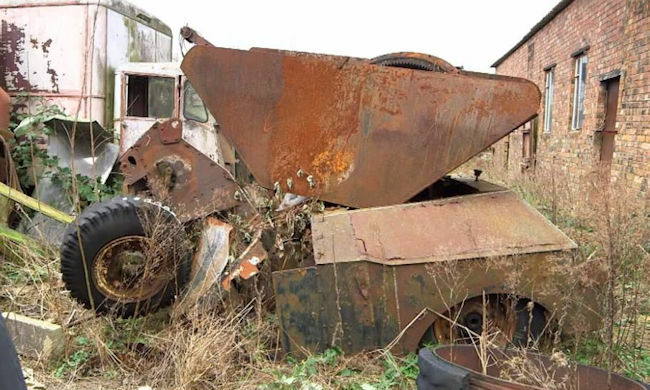 Surviving vehicles are now on display at the Imperial War Museum Duxford, Bovington tank museum, and the Military Museum at Port Dickson, in Malaysia. Morris Mk.I, early production version, Great Britain, 1941. Morris Mk.I in North Africa, now preserved at Bovington. Morris LRC Mk.II in Normandy, summer 1944. Morris LRC Mk.II in Tunisia, RAF patrol guard, now preserved at Duxford.